Well, I’m still alive! I made it through my first marathon and first race. A lot of people wondered why I went for such a big goal for my first, but my family will tell you I like to bite off more than I can chew. But now I know that I can take on the big challenges in life. More importantly I’ve learned how crucial a team and support is to big endeavors. Yesterday was rough, I died a few times on the course. But the amazing coaches, Team in Training (TNT) staff, cheerleaders, bands, and just some great San Diego locals helped me keep going. Even better were all the people I met on the course. TNT runners, others who were just running, and the volunteers at all the water and med stations. I knew long into training that it was going to be a hard race. My body is not really built for full marathons. Well not yet. My new goal is a half marathon, which I’ll be running the whole course if I can. Training will start at the end of this month and the race is in November. So I’ll be resetting my countdown. I won’t be with TNT this time, but I’m sure I’ll join them for a few runs here and there. I’m also going to check out some other groups in town. Towards the end I met two amazing women from Calgary, Canada and we pushed each other till the end. We even took our victory photo at the end together, so I can remember them forever. It all sounds fun and positive, right? It was definitely those things, but there is an emotional side to running a marathon. Especially when you run it for a cause. I was running in memory of my Grandma Virginia, and my Grandaddy Big Jack. Serval times when coaches were giving me pep talks to keep me going, they would tell me to think about those people who I was running for. As soon as I did the emotions would overtake me. In the last 4 miles all I could do was focus on my new found running partners and talk them over the finish line. If I had really thought about friends and family I would have probably collapsed in tears. 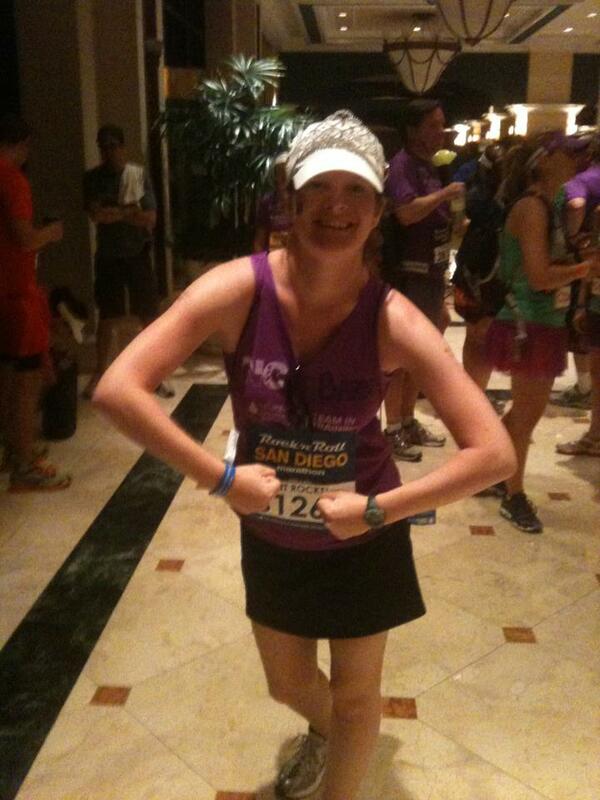 Thankfully I had provided my own encouragement and motivation by wearing a tiara on top of my hat for the race. I bought it on my birthday to have a little fun with my teammates at our pasta dinner. 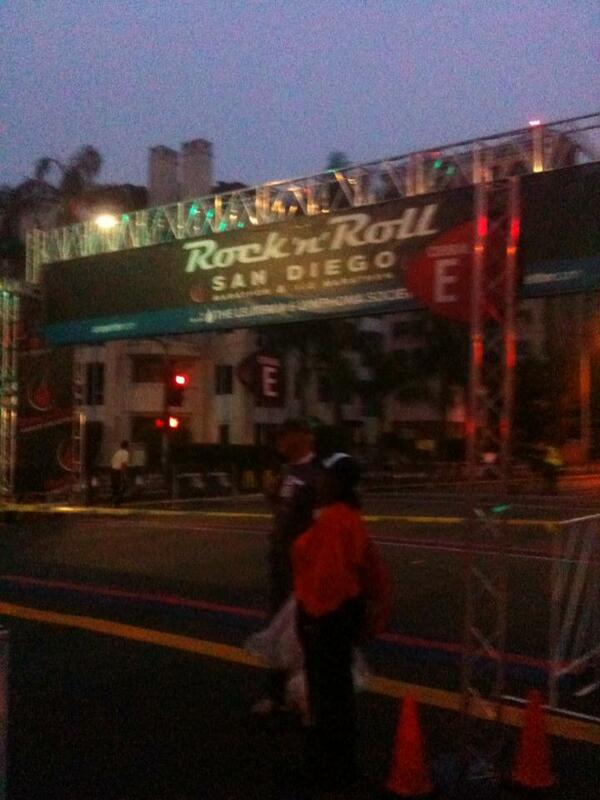 Initially we joked about me wearing it for the race, costumes being an integral part of the Rock n Roll marathon series. But then during the night when I couldn’t sleep I remembered why I started wearing a tiara on my birthdays. It was to remember all the birthday dinners with my Grandma Virginia and the little glitter cardboard tiaras and crowns she would have for us to wear. That was all I needed to make up my mind. So yesterday I put all my gear on and rub on tattoos. I had shoe bling, a fuel belt, hot pink socks, and then a big beautiful tiara. All through the race I got compliments and was able to share the story of why I was wearing it. That was such a motivator, that I might run with a tiara more often… Just kidding. I’m headed home with an experience of a lifetime, a big medal around my neck, sore muscles, sunburn, and the title of marathoner. So what goal do you want to accomplish? Believe me, you can reach it.